If Lexington Square isn’t enough of a reason to move to Bridgeport, Polo Cafe will surely have your tastebuds decide! 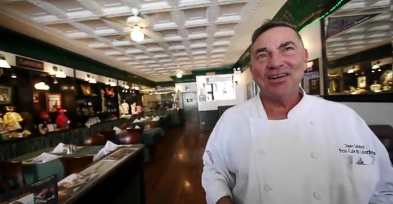 Bridgeport’s Polo Cafe has been owned by Dave Samber for over 30 years. The restaurant was once an old theater and he has since turned it into his own stage. Lexington Square was able to meet Dave at Polo Cafe and learn about his passion for the restaurant and how it has evolved over the years. Polo Cafe is also in its 3rd season of the Bed and Breakfast which is housed on the second and third floors. The B&B can accommodate up to 20 guests in 10 themed bedrooms and 4 suites. Lexington Square is proud to reside in Brideport among many other wonderful businesses such as Polo Cafe that make this area special. To top it all off, Polo Cafe was recently ranked number 1 on the popular TripAdvisor site. We wouldn’t miss this restaurant for anything, and not especially for the Creme Brulee French Toast during Saturday Brunch! *To view the video “Lexington Square meets Polo Cafe in Bridgeport”, click here!